Thanks to Gateway Greening, St. Louis Community Bank, Home Depot, a private donor, and our Cabrini community, our garden is flourishing! The upper division students helped move about 3 tons of rocks and 10 cubic yards of soil into each garden bed. During recess, a group of fifth graders helped construct a new large wooden planter for our serviceberry tree that will eventually provide us with edible berries. The first and third graders successfully grew and harvested 5.5lbs of radishes and about 1lb of bok choi this fall. The 8th graders planted the serviceberry tree and raspberry plants. The ETP classes planted bulbs in some of the tire planters and a few different classes helped to plant strawberry plants. All of the classes helped with watering. In the beds that aren’t dedicated to fruit bearing plants, we hope to grow fresh veggies in the spring. Half of our crops will be shared with the Cabrini community and the other half will go to Our Lady’s Inn. 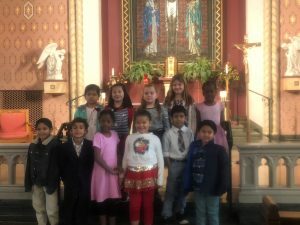 Second grade celebrated First Reconciliation on November 17, 2018.